Might be worth stocking up for Christmas....? Looks as though there are a number of spirits included in the offer. 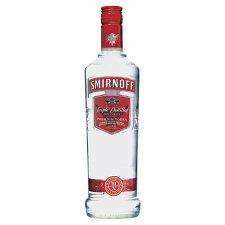 The 1ltr Smirnoff works out at a saving of £7.89 against its' "normal" price of £20.89. Unsure of the etiquette on sub-posts - perhaps someone could advise...? Thankyou Starr4 - that's what I thought! very good price, got some to stock for later, thank you! I prefer my vodka nice and chilled - can't stomach it hot. 29 shots in a litre. £13 / 29 = £ £0.45 a shot. Why, do you work for Smirnoff and hate the actual drink but agree with their ethics? Or if you're my mother, £3.25 a shot. Bought 2 bottles of this the other day, great for Vodka Jellies!!! Mrblubo Most of Polish vodkas here are bootlegged so unless your liver is already in disarray, you are welcome. Even official distributors often wouldnt talk about the origins of Polish vodka. Ir reminds me of the previous Spanish and French wine scandals. A each bottle deserves a thread in it's own. Some people might just search for Smirnoff and not find it buried in a morgan spice thread. Mrblubo Most of Polish vodkas here are bootlegged so unless your liver … Mrblubo Most of Polish vodkas here are bootlegged so unless your liver is already in disarray, you are welcome. Even official distributors often wouldnt talk about the origins of Polish vodka. Ir reminds me of the previous Spanish and French wine scandals. Why, do you work for Smirnoff and hate the actual drink but agree with … Why, do you work for Smirnoff and hate the actual drink but agree with their ethics? smirnoff is scandelous, produced and bottled in the UK, and still charged at the same rate as proper premium vodkas like finlandia, eristoff, russian standard etc. Smirnoff is actually quite good. Type Smirnoff in your mobile phone (not i.phone) using predictor text & see what word it comes up with lol!!!!!!!!!!!!!!!!! Restricted to 6 bottles per customer. Excellent deal just bought 6. I agree that this deserves its own thread. smirnoff is scandelous, produced and bottled in the UK, and still charged … smirnoff is scandelous, produced and bottled in the UK, and still charged at the same rate as proper premium vodkas like finlandia, eristoff, russian standard etc. and its just ****. I've got to say, I prefer the taste of Smirnoff Red over Russian Standard any day of the week. Can't comment on Finlandia as I don't think i've tasted it. You're right Eristoff is good, but i'm not sure I would rate it incredibly higher than Smirnoff Red. Smirnoff Black is damn tasty neat, and Grey Goose is also extremely good. Zubrowka is great with apple juice making a "frisky bison". In the end it's pretty much all down to personal preference. *hic* just finished my bottle of eristoff £10.49 from sainsburys off to tesco in the morning! based on sales and advertising i would say that smirnoff have cornered the vodka market. i agree with you mate my favourite is graduate from morrisons but thats by the by . When do you ever taste vodka ? You mix it with stuff and don't even taste it. So why it matter? I applaud the effort but they compared grain, wheat and rye vodkas which is about as retarded to comparing a lager, bitter and ale.. pedantics aside that's also smirnoff produced in the US, which is as equivalent to sminoff produced in the UK as budweiser is to budvar. That's right but that 'batch' could not reach supermarket's shelves for sure. Thus as long as you buy from reputable seller / or supermarket you should get the original,usually good or very good quality vodka.